Incense (Hebrew: קְטֹ֔רֶת, qetoreth, "smoke", "odor of (burning) sacrifice", "incense"; Latin: Incendere, "burn") is any botanical aromatic substance or mixture of such substances, assembled and burned for the purpose of producing a fragrant or pleasant odor. Typically, people burn incense either to scent a room or to offer an oblation to God or a pagan deity. Stacte (Greek στακτή, staktḗ) or nataph (Hebrew: נטף, nataf) is a gum resin, probably of the storax shrub Styrax officinalis. One gathers this resin by making small cuts in the shrub to allow the resin to bleed out. Stacte is therefore a symbol of the blood of Jesus Christ, which would be shed for the sins of mankind. Onycha (Greek ονυχή onukhé, finger nail) (Hebrew שְׁחֵ֙לֶת֙, shecheleth, aromatic shell) is the operculum of the snail Onyx marinus. One derives a fragrance from it that is regarded as an aromatic fixative. It would thus be a symbol of Christ's preserving or saving power. Galbanum (Hebrew חֶלְבְּנָ֔ה, chelbenah, fragrant resin) is another gum resin, the product of Ferula galbaniflua and other members of the genus Ferula. One obtains it by incising the roots of the Ferula plant and collecting the resin. Galbanum was known to the ancients for its medicinal value. Its place in the special incense of the Tabernacle would thus be symbolic of Christ's power, not only to save from sin, but also to heal from sin. Frankincense (Hebrew לְבְּנָ֔ה, lebonah) is a resin from the tree Boswellia thurifera, obtained by cutting off a strip of bark, typically 5 inches long, and waiting three months for the resin to ooze out and harden. Frankincense is a stimulant, and the Roman historian Pliny the Elder mentioned it as an antidote to hemlock. It is thus a symbol of the power of Christ to quicken, or revive, a man dead in his sins. As the Bible quote says, the recipe called for combining the above ingredients in a 1:1:1:1 ratio and beating it to a fine powder before burning. The Aaronic priests, and only the priests, were authorized to burn incense; this they did on the altar of incense. 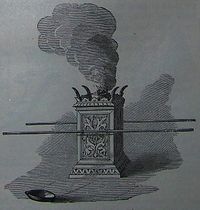 Nadab and Abihu lost their lives when they burnt some of this incense in the Holy of Holies using strange or common fire. Korah and his fellow mutineers died when they dared to burn this incense before God when that was not their office. When King Uzziah of the Kingdom of Judah attempted to burn incense in the Temple of Jerusalem, he was stricken with leprosy and served the remainder of his reign in quarantine. As a special and holy recipe, this incense was never to be used for any purpose other than to burn it before God in the Holy Place. This is probably the first recorded instance of a specific prohibition against the commercialization of a holy thing. Today almost every use of the term incense refers to pure frankincense or to a mixture of which frankincense is the chief ingredient. This might perhaps be so because frankincense is more readily obtainable than is any other aromatic substance. 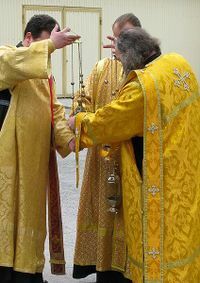 Incense is used in the Roman Catholic Church, the Russian Orthodox Church, and occasionally in the Anglican Communion and its worldwide provinces. But no Christian church today uses the original Tabernacle recipe of stacte, onycha, galbanum, and frankincense in equal portions. ↑ "7004. qetoreth". http://biblesuite.com/hebrew/7004.htm. Retrieved November 14, 2013. ↑ "Stacte," Ancient Grove and Garden, n.d. Accessed December 6, 2008. ↑ "Onycha." Scents of Earth, n.d. Accessed December 6, 2008. ↑ Grieve, Mrs. M. "Galbanum." Botanical.com, n.d. Accessed December 6, 2008. ↑ Grieve, Mrs. M. "Frankincense." Botanical.com, n.d. Accessed December 6, 2008. This page was last modified on 14 November 2013, at 10:00.